On February 15, the United Nations Security Council (UNSC) met in an unofficial capacity to discuss one of the most pressing threats of our time: climate change. Last month’s meeting was convened at the behest of the UNSC’s current President Pakistan and the U.K., and was only the third time the Council met to address the issue since 2007. 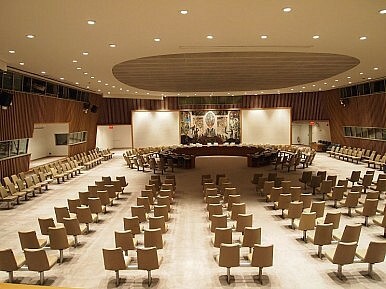 Nevertheless, permanent UNSC members China and Russia used their veto power to block the members from debating the issue in a formal meeting, instead forcing the Council to discuss it in a so-called “Arria-Formula” meeting; an informal, confidential meeting used to have a frank exchange of views. Their action was supported by a coalition of 130 (mainly developing) states, who asserted that climate change has no place in the Security Council, and like Moscow and Beijing argued that the issue is best addressed in the UNFCCC and the General Assembly. A possible reason that China and Russia objected is that they have typically opposed to any expansion of the Council’s peace-keeping responsibilities, whatever the cause. This makes addressing climate change, an emerging security issue, very difficult in the UN context. They were supported by a coalition of 130 (mainly developing) states who asserted that climate change has no place in the Security Council. Their opposition likely stems from UN politics, where in the General Assembly, developing countries rule by volume, while in the Security Council, the large developed states carry the day. The truth is that climate change is a clear and present danger to global security as changing weather patterns are inherently destabilize and exacerbate existing tensions within and between states by disrupting food, water, and energy security. As the American Security Project’s Climate Security Report outlined, climate change creates insecurity by greatly increasing the frequency and severity of droughts, flooding, wildfires, food insecurity and water scarcity, as well as undermining agriculture, infrastructure, economic well-being and public health. As the U.S. Department of Defense has argued persuasively, climate change in and of itself is unlikely to cause conflict, but instead acts as an “accelerant of instability or conflict,” which are hardly in short supply around the world. Similarly, countries as varied as Latvia, Indonesia, Malawi, and Qatar have made unequivocal statements acknowledging the very real security dimensions of climate change. In fact, research has found that over 70 percent of countries worldwide consider climate change a serious security threat. It’s rare to find such consensus within the international community, which only serves to underscore the widespread impact of the issue. Ironically, many of the states that voted alongside China and Russia at the UNSC are the very same countries that will be the most affected by climate change in the shortest period of time. India, for example, opposed Security Council action despite the fact that climate change has already contributed to the outbreak of substantial violence in the country. A long-standing land dispute has developed in Assam between native Bobo people and Muslim migrants from Bangladesh who began arriving in India decades ago largely as a result of rising sea levels making their lands uninhabitable. The land dispute has repeatedly led to outbreaks of intense conflict, most recently last summer when riots killed 100 people and uprooted as many as 400,000 individuals from their homes. More generally, India relies heavily on monsoons to grow crops such as rice, wheat and corn, and climate change is already choking off these vital rains. China and Russia themselves are no exception to this general pattern. Indeed the Chinese government itself identified climate change as a security threat in its most recent Defense White Paper. This is hardly surprising given all the issues it faces— for example a shortage of fresh water— that are worsened by climate change. Likewise Russia suffers from incredibly intense wildfires; most notably in 2010 when fires resulted in an estimated 55,736 deaths and more than $15 billion in damage, as well as destroying approximately 2.5 million acres of forests, causing global food prices to skyrocket. As the example of Russian wildfires creating global food insecurity underscores, climate change is a security threat that is global and interconnected. Just as no one country can tackle climate change unilaterally, no country can insulate itself from the negative impacts it causes around the world. This is precisely the kind of security challenge that the UNSC alone is capable of addressing. Make no mistake: at some point the UNSC will be forced to take serious action on climate change. The only question is whether member states will work-up the courage to tackle it head on today in a comprehensive and result-oriented approach, or whether the world will have to address it in a reactive and piecemeal fashion in the future. Andrew Holland is a Senior Fellow and Xander Vagg is a Junior Fellow at the American Security Project where they work on Energy and Climate Policy, most recently in compiling ASP’s Global Security and Defense Index on Climate Change, a comprehensive guide to how governments and militaries around the world are planning for the strategic threats of climate change. The preliminary findings of the index are available on ASP’s website.